Luis Alexander Basabe does not have any MLB stats for the season. Single … his twin brother, Luis Alejandro, plays in the Arizona system … both originally were signed by Boston as free agents in 2012...Is a 2012 graduate of Juan Pedro Chourio León High School. Hit .258 (113-438) with 21 doubles, eight triples, 15 home runs, 56 RBI, 77 runs scored, 64 walks and 16 steals in 119 combined games with Class A Winston-Salem and Class AA Birmingham ... Hit .327 (35-107) against lefties and .340 (16-47) with RISP … hit all nine of his home runs off right-handers ... Was named to the Carolina League midseason All-Star team ... Was named White Sox Minor League co-Player of the Month for April after batting .313 (26-83) with seven doubles, three triples, four homers, 17 RBI, 16 runs scored, a .400 on-base percentage and .614 slugging percentage over 21 games ... Was promoted to Birmingham on 6/21 ... Was the starting center fielder and leadoff hitter for the World Team at the All-Star Futures Game on 7/15 at Nationals Park … hit a two-run homer off Hunter Greene in the third inning (pitch was recorded at 102.3 mph per MLB Statcast) ... Recorded a 15-game hitting streak from 7/9-27 (.315, 17-54) ... Played in 15 games with Glendale in the Arizona Fall League ... Entered the season ranked by Baseball America as the Best Defensive Outfielder in the Sox system. Spent the entire season with Class A Winston-Salem in his first season in the White Sox organization...Appeared in 92 games in center field, 12 in right and two as the DH … batted .277 (18-65) in April and .273 (9-33) in August...Recorded a 10-game hitting streak from 4/13-26 … registered three hits on 5/24 at Myrtle Beach...Was placed on the disabled list on 8/14 with a sprained left knee and missed the remainder of the season... Appeared in six games with Caracas in the Venezuelan Winter League, going 3-17 (.176) with one double and two RBI...Entered the season rated by Baseball America as the No. 8 Prospect in the White Sox organization. Batted a combined .264 (112-425) with 26 doubles, nine triples, 12 home runs, 53 RBI and 25 steals in 110 games with Class A Greenville and Class A Salem in the Red Sox system ... Was successful on 83.3 percent (25-30) of his stolen-base attempts, including 15 straight to open the season ... Reached base safely in SAL-best 29 straight road games from 4/14-7/5, batting .351 (39-111) with a .451 on-base percentage ... Hit .299 (69-231) in the second half … recorded a 15-game hitting streak from 7/10-29 (.410, 25-61) ... White Sox acquisition was recommended by Joe Butler. Was named to the New York-Penn League All-Star with Advanced Rookie Lowell ... Ranked among the NYPL leaders in home runs (3rd, 7), walks (7th, 32) and stolen bases (10th, 15) ... Was rated by Baseball America following the season as the No. 6 prospect in the NYPL. 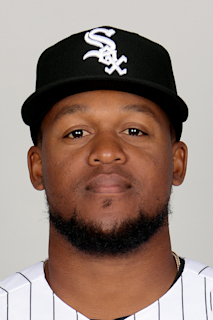 April 22, 2019 CF Luis Alexander Basabe assigned to Kannapolis Intimidators from Birmingham Barons. April 3, 2019 Birmingham Barons placed CF Luis Alexander Basabe on the 7-day injured list. March 8, 2019 Chicago White Sox optioned CF Luis Alexander Basabe to Birmingham Barons. October 1, 2018 Chicago White Sox recalled CF Luis Alexander Basabe from Birmingham Barons. July 16, 2018 Birmingham Barons activated CF Luis Alexander Basabe from the temporarily inactive list. July 14, 2018 Birmingham Barons placed CF Luis Alexander Basabe on the temporarily inactive list. June 21, 2018 CF Luis Alexander Basabe assigned to Birmingham Barons from Winston-Salem Dash. March 14, 2018 Chicago White Sox optioned CF Luis Alexander Basabe to Winston-Salem Dash. March 13, 2018 Chicago White Sox optioned CF Luis Alexander Basabe to Winston-Salem Dash. November 20, 2017 Chicago White Sox selected the contract of Luis Alexander Basabe from Winston-Salem Dash. October 23, 2017 OF Luis Alexander Basabe assigned to Leones del Caracas. September 6, 2017 Winston-Salem Dash activated CF Luis Alexander Basabe from the 7-day disabled list. August 15, 2017 Winston-Salem Dash placed CF Luis Alexander Basabe on the 7-day disabled list retroactive to August 13, 2017. April 6, 2017 CF Luis Alexander Basabe assigned to Winston-Salem Dash from Kannapolis Intimidators. March 4, 2017 OF Luis Alexander Basabe assigned to Chicago White Sox. December 6, 2016 CF Luis Alexander Basabe assigned to Kannapolis Intimidators. September 1, 2016 CF Luis Alexander Basabe assigned to Salem Red Sox from Greenville Drive. April 5, 2016 CF Luis Alexander Basabe assigned to Greenville Drive from Lowell Spinners. March 18, 2016 CF Luis Alexander Basabe assigned to Boston Red Sox. June 18, 2015 CF Luis Alexander Basabe assigned to Lowell Spinners from GCL Red Sox. July 23, 2014 CF Luis Alexander Basabe assigned to GCL Red Sox from DSL Red Sox. July 17, 2014 CF Luis Alexander Basabe assigned to GCL Red Sox. June 1, 2013 CF Luis Alexander Basabe assigned to DSL Red Sox. August 26, 2012 Boston Red Sox signed free agent OF Luis Alexander Basabe to a minor league contract.